iRobot Roomba 675 Robot Vacuum . 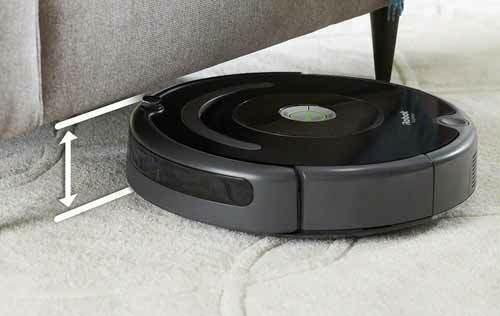 The new Roomba 675 is one of iRobot’s lowest priced robot vacuums with WiFi connectivity. 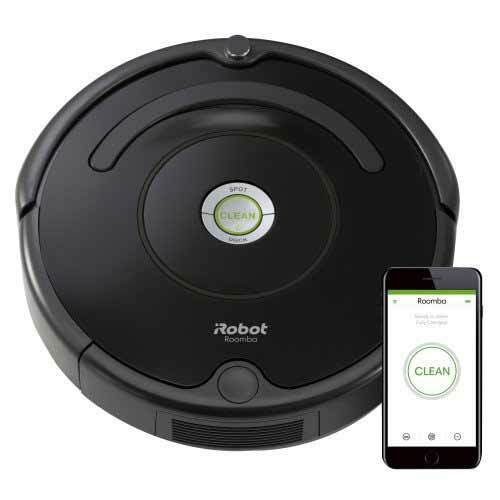 Using WiFi and the free iRobot APP, you control your Roomba 675 with your smartphone to start/stop, and schedule cleaning. You can also use Alexa or Google Assistant to control your robot vacuum with your voice. The iRobot Roomba 675 is effective at getting dirt, dust, pet fur, and pet hair from a variety of surfaces using its patented 3 stage cleaning system. This sophisticated robot vacuum has Dirt Detect technology uses an acoustic sensor to identify dirtier areas and spends more time cleaning them. Using advanced software and sensors, the Roomba 675’s iAdapt technology ensures that it vacuums every section of your floor, including areas you cannot easily reach, such as under furniture. Dirt Detect™ sensors work harder on ground in dirt areas. As a multi-floor vacuum, this robotic vacuum will automatically adjust to clean carpets, hardwood, tile, and linoleum floors as it moves through your home. Roomba will vacuum every section of your floor multiple times, and its advanced software allows it to get around obstacles, move along walls and to avoid falling down stairs, drop-offs, and avoid tangles from loose cords. The improved brush requires less cleaning, as the brush mechanism cleans itself most of the time. AeroVac Technology: Optimized airflow pulls hair off Roomba’s brushes and guides it to the back of the AeroVac bin. The Roomba 675 starts working for you at the push of the CLEAN button (on the top of the vacuum), or through voice or Smartphone control. 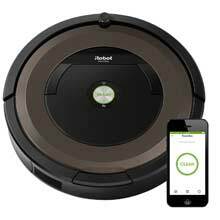 iRobot Roomba 675: The iRobot 675 can vacuum hard floors, rugs, hardwood, laminate, tile, and carpet. Long life lithium ion battery keeps it running longer (90 minutes). Just 3.6 inches tall, the robot vacuum can fit under most beds, and furniture. The Roomba 675 will automatically return to its Home Base® to dock and recharge between cycles. The 3-Stage cleaning system uses agitation, brushing and suction to get the dirt and dust. What’s in the Box: Charging dock, a line cord, an extra dust filter, a flat cleaning tool, and the iRobot user guide..
Smart-Review Commentary: The iRobot Roomba 675 is one of the lowest priced robot vacuums that is equipped with Wifi. This model connects via a free iRobot APP to your smartphone or tablet. Once connected you can control your vacuum or schedule future cleanings. For simplicity you can simply press the CLEAN button on the top of the vacuum and away it goes. It will automatically return to base to charge when it is low on battery. The 675 model uses sophisticated power management software to deliver longer battery life with lithium ion batteries to provide up to 90 minutes cleaning. iRobot vacuums are extremely sophisticated cleaning machines, using the latest software and sensor technology to vacuum your entire floor, yet avoid obstacles. Dirt Detect™ sensors tackle ground in dirt. It will clean areas that vacuums rarely go, such as under furniture, under a bed, in corners. The Roomba 675 is equipped to handle fibers like hair, pet hair, pet fur, lint and carpet fuzz. It is ideal for those with pets. The larger dust bin requires less emptying than previous models. This vacuum can do a comparable job to many uprights, because this vacuum goes over a dirty area many times, until clean, using Dirt Detect technology. If this fits your lifestyle, it is an excellent robot vacuum to clean your rooms while you do other activities. This model has received outstanding reviews by consumers. 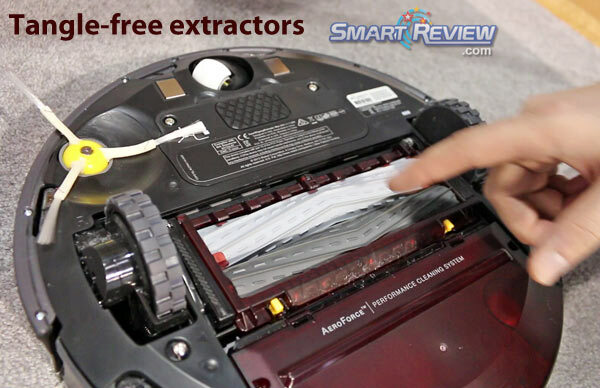 This model is a Smart-Review top pick for connected robotic vacuums.